Marquette (13-2, 3-1) scored its first bucket immediately after the opening tip, and never looked back. Jerel McNeal led MU with 18, but the Warriors had 5 guys in double digits, and the stud of the game was clearly Lazar Hayward. Lazar poured in 17 on 6-11 shooting, 4 steals and a team high 11 rebounds, a quality double-double in 28 minutes. His performance was superlative, though the rest of the team had a couple dozen highlight reel moments themselves. 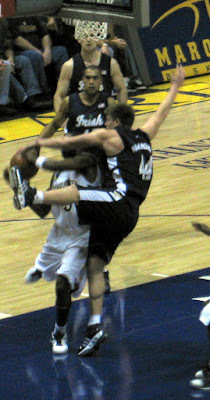 Marquette had no answer for ND's Luke Harangody, who easily poured in 29 points. With 15 minutes left, a guy in the row behind me said "That guy is going to hit 30 points." My answer: If we're lucky. -- Harangody is the real deal, and Burke, Ooze, and occasionally Trend Blackledge, "guarded" him to no avail, getting whistled 13 times. Fortunately, when Marquette did have the ball, they found the net, hitting 46% for the night, and an huge 50% from 3-point land. MU also stole the ball 17 times, and had a great 23 to 13 Assist/TO ratio. Trend had a quality outing, however, going 3-3, 6 points and two blocked shots in 14 minutes. On the post-game show, Crean gave credit to his wife Joani, who told him to play Trend more. Who knew Joani was the evil genius behind Tom? Of note, Notre Dame had a couple thousand fans in attendance in the "sold out" Bradley Center. I'd bought tickets for a group of friends, who ended up next to a large Domer section. My good friend, Matt, said it was OK to be so close to them, because "you could see their tears better." Great game. But I disagree with your conclusion: the stud of the game was McNeal. He looked "Wade like" for the last 10 minutes of the 1st half. Lazar was great, but Mcneal looked like a late 1st round pick. The balance of the team was awesome. ND had 1, maybe 2, players. We had 7-8! and Trend, his block of Harangomer was awesome. I stand by the Finisher as the MVP of this team. McNeal is a close second. Great game by both today. Just a great game. And it was awesome to see Trend get in there. Burke is terrible. Trend should have half his minutes. Lazar Hayward's tears can cure cancer...too bad he never cries. Rough game for the Irish. Not a good way to play your first true road game: ranked rival with good guards coming off a couple disppointing performances. Marquette really won this game on the perimeter: shutting down McAlarney and hitting the open threes. Congrats on the win. We'll look to return the favor in South Bend. Marquette is a team that is capable of having a game like this, but can they shoot 3's consistently and be a legitimate threat in March? I think they can make a run even with no inside game, but I would like to see them get to the line more. Hayward, McNeal, and Matthews need to attack the basket particularly when the jumper isn't falling. Rebounding is definitely a concern, and it's really a shame they lost Mbakwe because the kid can board. My overall assesment is that they are clearly below UNC, Memphis, UCLA, and Kansas but can win the Big East and get a 2 seed. Wins over L'ville and UConn on the road would be huge. Blackledge looks promising but let's not get crazy here. Our game down low is PATHETIC. Can we finish a basket or possibly use the glass? No one can finish a hoop down low! A glaring weakness!!!!! Did you mention that Joanie? My good friend, Matt, said it was OK to be so close to them, because "you could see their tears better." .....domers were still crying about football season? While the victory was sweet, Marquette I don't feel is entittled to bragging rights till after the ND game in South Bend. McNeal got a ton of his points after the outcome was decided. I agree with Hayward as player of the game. His points came when it mattered.